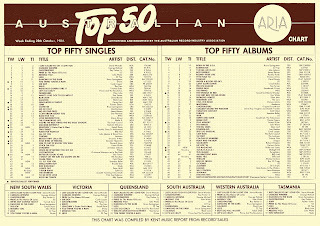 Some singers have the worst luck - and the female vocalist behind the highest new entry on the ARIA top 50 this week in 1984 is a case in point. Her name is Hazell Dean and, Stock Aitken Waterman devotees aside, you probably only vaguely remember her (or don't recall her at all). Due to her performance on my personal year-end charts, Hazell ranks as one of my top 10 favourite acts of the '80s. But in Australia, the British performer only ever had one hit and in the UK, many of her best songs failed for a variety of reasons. A song that did anything but fail remained at number 1 in Australia this week in 1984. "I Just Called To Say I Love You" by Stevie Wonder was on top for a second week. A slight improvement chart-wise on the lead single from their previous album, but this first track lifted from Animalize (co-written by Desmond Child) didn't put KISS back inside the top 50. More hard rock now and the biggest single - a US top 5 smash - from San Francisco's Night Ranger. The power ballad was written about drummer Kelly Keagy's sister called Christy, but his band-mates misheard what he was singing and the alternate name stuck. He had a number of top 50 albums throughout his career, but this single from Couldn't Stand The Weather was the only singles chart appearance for the blues guitarist/singer. They'd have hoped to have done better with their first new music in 11 years and first top 100 appearance since 1968, but the duo that racked up eight top 5 hits between 1957 and 1961 couldn't score in 1984 with this Paul McCartney-penned tune. Given Queen's popularity in Australia, it's surprising this first solo effort by the band's singer (which made the UK top 10) did so badly locally. The track was co-written and co-produced by Giorgio Moroder for use in the 1984 revamp of film Metropolis. "The Stroke" had been a top 5 success in 1981, but American rocker Billy Squier hadn't been able to return to the Australian top 50 ever since... until now. Although, by spending a single week at number 50 with this lead single from fourth album Signs Of Life, he barely avoids qualifying for my definition of a one-hit wonder. "Rock Me Tonite" was actually Billy's biggest hit in the US, where it reached number 15, but it's credited with bringing about the rapid demise of his career thanks to a music video which is now widely viewed as among the decade's worst. I'd never seen the clip before, but it does contain some of the most terrible dancing ever put to film. Speaking of dodgy '80s music videos, the promo for "The Warrior" has been described by singer Patty Smyth as looking like "an off-Broadway production of Cats". In recent weeks, we've seen singer Patty's post-Scandal hit, "Sometimes Love Just Ain't Enough", debut in my flashbacks to 1992. "The Warrior" was the other song she took into the ARIA top 10, back when she was the frontwoman for American rock band Scandal - a role for which she received featuring billing (possibly to distinguish Scandal from the late '70s Australian band of the same name). Scandal didn't have any further hits and had disintegrated by 1985, leading Patty to pursue her solo career. Fun fact: in 1997, Patty married '80s tennis legend John McEnroe, who coincidentally enjoyed his best season in 1984. From a band whose singer would soon go solo we move now to the solo debut for ex-J Geils Band frontman Peter Wolf, who'd parted ways with his former band following a difference of opinion about their musical direction. The title track of his first album on his own, "Lights Out" was fairly consistent with the pop/rock style of tracks like "Centrefold" and "Freeze Frame", while J Geils Band went with a more new wave sound for their only album without Peter (and missed the top 50 with its lead single in early 1985). In the US, Peter did much better with his solo career than in Australia, with both "Lights Out" and 1987 single "Come As You Are" reaching the top 20. After three consecutive top 12 hits, it was a bit of a comedown for Spandau Ballet with this second single from Parade. Two things would've worked against "I'll Fly For You": 1) Parade hadn't left the top 30 since debuting on the albums chart in late July and 2) as a song, "I'll Fly For You" takes a while to get going - the verses are a bit dull and it's nearly two minutes before the (excellent) chorus comes in. If it had been me choosing singles from the album, I would've picked "Round And Round" at this point instead of leaving it until fourth. As former chart-topper "What's Love Got To Do With It" fell out of the top 10 this week, it was joined on the top 50 by the next single from Private Dancer - a song that would do nowhere near as well here or in the UK (although it made the US top 5). A rockier track than its predecessor, "Better Be Good To Me" had first been recorded in 1981 by Spider, which featured co-writer Holly Knight in its line-up. Tina Turner's hit was one of two songs co-written by Holly that entered the top 50 this week. The other? "The Warrior". 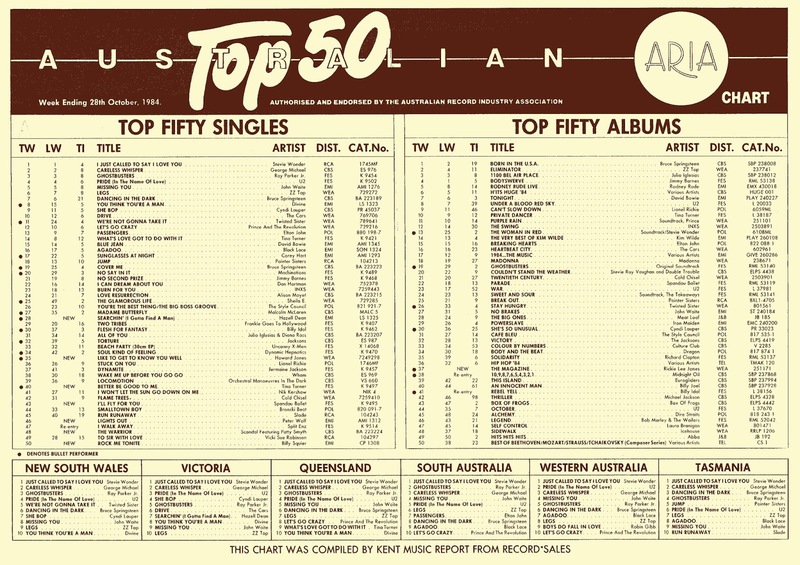 After the singles from his first album spectacularly under-performed locally, Australia was finally getting to know Howard Jones well as he reached the top 20 for the first time. "Like To Get To Know You Well" was the lead single from second album "Dream Into Action" and came with two music videos you can see below - one for the UK market and one for the US. Hazell Dean had been putting music out since the mid-'70s without any UK chart success. Her first foray into Hi-NRG, "Searchin' (I Gotta Find A Man)", had been released there in mid-1983 but also flopped. In April 1984, after months of being played in gay clubs, the song was re-released, making the UK top 10 and, several months later, the ARIA top 20. Hazell went one better with the follow-up, teaming up with on-the-rise producers Stock Aitken Waterman for "Whatever I Do (Wherever I Go)", which reached number 4 in Britain. The reworked version of "Dance Your Love Away" by Michael Prince became the first SAW-produced single to land inside the UK top 10, but would not be the last time the Hit Factory would offer Hazell a track previously recorded by someone else. Things hit the skids when "Back In My Arms (Once Again)" and "No Fool (For Love)" both peaked at an unlucky number 41 in the UK. And between 1985 and 1987, a string of excellent singles - including the SAW-produced "They Say It's Gonna Rain", "Stand Up" and "Always Doesn't Mean Forever" - went completely overlooked. A cover of Anne Murray's "Who's Leaving Who" took her back into the UK top 5 and she scored one final UK top 20 hit with "Maybe (We Should Call It A Day)", rivalling Samantha Fox for her love of bracketed song titles. After that, Hazell released her version of Kylie Minogue album track "Turn It Into Love", a cover version of "Love Pains" released at the same time as a remake by Liza Minnelli and her version of Lonnie Gordon album track "Better Off Without You" - each with diminishing returns. All great songs, but it was beginning to feel like a career forged out of covers and cast-offs. Twenty-three years after it gave Hazell her only Australian hit, "Searchin..." returned to the ARIA chart thanks to a remake by Young Divas. Unlike their two top 10 SAW remakes, "This Time I Know It's For Real" and "Happenin' All Over Again", it scraped the bottom of the top 40. And if you've got this far without your eyes glazing over, it's also worth checking out Hazell's own 1997 remix of "Searchin'...". Next week: one of the biggest bands in the world returns with what some consider to be their worst single. Plus, a former member of the band that used to be the biggest in the world lands the final solo top 10 hit of his career. Very nice Spandau Ballet song. As yourself, I'd prefer "Round & Round" as well but I've grown on "I'll fly for you". Their amalgamation of jazz/new wave/soft rock makes them quite pleasant sounding. One of my favourite bands of all time. I love Howard Jones' music but I found "Like to get to know you well" a little repetitive however it has a groovy beat.